194 miles from Storuman to the Arctic Circle in the Province of Lapland. Overnight we'd been parked in a glorified lay-by just outside the town of Storuman - a place who's claim to fame is the fact that it hosts the World Arm Wrestling Championships - but not while we were there! Our first job for today was to head into the town itself to refuel, but that was a task that was becoming a bit of a bugger because nearly all the filling stations in Sweden are automated and nearly all charge a refundable deposit that they nearly always forget to refund once the payment for the fuel has cleared 😠😠!! Unfortunately, there is no option to pay cash at these places and the deposit is usually between 1000 and 1500 SEK (£80 - 130) + the cost of the fuel, so when your filling up regularly as we are at the moment a big float is required on your currency card to keep it in credit! (We use a Caxton Card which we pre-load with the currency of the country we're in to avoid paying excess bank charges on each transaction). And because the garages make this omission the only way for us to get our money re-credited is to ring Caxton Customer Services and ask them to sort it out, so we're just keeping our fingers crossed that we wont be obliged to use the same system once we're in Norway! Today's journey was always going to be one of our longer ones on this tour, and our target for today was a Camper Stop on the edge of the Arctic Circle which is the southernmost latitude where the midnight sun can be seen. It's position is defined by the inclination of the earth's axis which varies under the influence of the sun, the moon, and the other planets, so therefore, it's position changes by a small amount each year, but for our purposes the camper stop was going to mark our cross over! The scenery on our journey was much the same as we'd been experiencing over the last few days - more forestation and lakes - and even though these sights would usually be 'just our cup of tea', when your seeing them day after day the novelty wears off a bit! After about 75 miles we stopped at a little picnic spot by a boulder strewn river that seemed very popular with fisher folk🎣 🐟! So once our coffee had been sipped we nipped out to stretch our legs, and not far from where we'd parked we found a wooden walkway that ran along side the river with seating, platforms and a 'fish house'! Apparently, the house was a unique construction built specifically to catch fish when they wondered into the shallows to feed, but I don't think the version we saw today was actually functional because it was a replacement for one built by a local man (Sven Forsen) back in the 1940's. At that time he had 3 such traps and the fish he caught in them provided a steady food supply for the nearby village. After our break we continued on for another 70 odd miles and then dived into another picnic area that also had services available to sort out T4rdis2's bilges that hadn't been emptied for 3 days! In both Sweden and Norway there are loads of these places and even if they don't allow you to actually stay overnight they facilitate our ability to wild camp somewhere else, and have thus saved us a fortune in campsite fees. After lunch we were soon back on the road to complete our journey, but by now Mrs Snoopy was mostly redundant because as we were just continuing to follow the E10 we didn't really need her help. Therefore, when she suddenly flipped over into night mode and remained silent we thought maybe she was sulking or that boredom had caused her to doze off 😴😴😴! 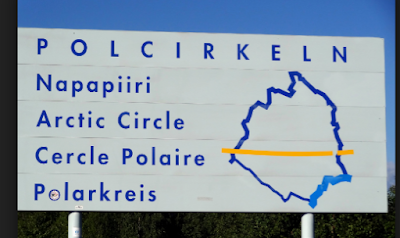 By now we were drawing quite near to the Arctic Circle (and as we're well above Iceland's latitude it's the furthest North we've every been), and even though it was quite sunny there was a definite nip in the out door temperature - but we're not complaining! Our latitude at the moment is 66.551 degrees north and that will only get higher in the near future (77.17 eventually), so we're just keeping our fingers crossed that it will stay fine and we're more than happy to wrap up warm to ward off any chills. For the last couple of days we've been travelling through Swedish Lapland which is often described as Europe's last true wilderness, and for us one of the testaments to that is the fact that for most of the time we've got neither phone of WiFi signal - therefore, while we're out in the wilds the regularity of our communications may be a bit hit and miss! The area also has very few main roads that are suitable for T4rdis2 - the E45 and E10 more or less being the only ones, so that leaves vast tracts of land that are truly wild and completely inaccessible to many, but much of it is used, as it has been for centuries by the indigenous Sami people for their reindeer grazing - and they were in evidence several times over today - the reindeer that is, not the people!! Our target for today was the town of Kiruna which would put us within easy striking distance of our next destination which would be the Abisko National Park, and from there we wouldn't have far to go to the Norwegian border. Our mission once we arrived in the town was to do a final grocery top-up, refuel T4rdis2 and also, if time allowed, we'd visit the LKAB Iron Ore Mine which is what the town is well known for. So, with another long distance to drive and lots to do when we got there we were packed up and on the road by 10am, and tootling along quite happily at about 60 mph! But we hadn't gone far when suddenly 2 large deer suddenly appeared as if from nowhere, and even though a huge white machine was bombing towards them at a rapid rate of knots they didn't really deviate from their path. Therefore evasive action from our end was required, so in your mind's eye you might just see T4rdis2 screeching to a halt with the front wheels smoking and our rear end high in the air! But No ...... it wasn't quite that dramatic - but the heavy breaking that was required was accompanied by at least two quite blue expletives from my dearly beloved!! Now, I'd like to say that after that we completed our journey without any further problems - but that just wouldn't be true! More expletives were uttered when we came across a 20km section of road works where the tarmac had been completely scooped away leaving a very bad unmade road surface that slowed us down to no more than 15 mph and nearly shook us to death! But even though we felt a bit sorry for ourselves in having to traverse that appalling section of road we felt even sorrier for the poor tour cyclists who had to pass through the deep gravel on narrow tyres with heavily laden bikes. Peddling for all that way must have been not only exhausting, but dangerous as well! So, as you would imagine, once that section was complete we breathed a bit of a sigh of relief - but that was jumping the gun because there was still more to come, and if anything, the second section was worse than the first! Therefore, because of our enforced crawl while we passed over the rough stuff it was much later than planned by the time we arrived in Kiruna so we quite quickly decided that the essential tasks of shopping and refuelling would have to be done but visiting the mine (who's Visitor's Centre lies 540 metres underground) would have to be omitted. However, even if we hadn't known about Kiruna's mining history, the huge slag heaps that appear as you approach the town are testimony to it's main industry. Kiruna is home to the world's largest underground iron-ore mine and much of it reaches under the current built up areas. Therefore, to prevent a future scenario of the town collapsing down into the earth there are plans to move much of it 3 km to the east over the coming years, and this will also facilitate further mining expansion. Another interesting fact (which I alluded to earlier) concerns this area's latitude (67 degrees North)! For saying we've only moved up by one degree on yesterday we've now apparently reached the point where the sun won't set at all! From roughly the last week of May and until the middle of July the sun doesn't fall below the horizon, but the pay back for this is that from the first week in December until the second week of January the days are dark for the full 24 hours. Once our shopping and refuelling were done we left Kiruna with the task of finding a wild camp spot for the night high on our priority list - and we didn't really have very far to go. 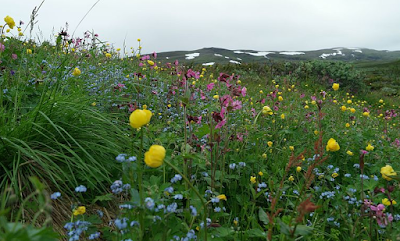 My very organised husband had identified a couple of rest-plats places along the road on the way to Abisko, and the first one we came to proved to be ideal. It was right beside a pretty river and there were several other motorhomers already ensconced, so we joined them and settled down to enjoy the rest of the all night sunshine!! Last night was a very peaceful one in our free rest-plats for saying we were quite close to both the main road and the Train Line that carries the iron ore from Kiruna to the harbour at Narvik in Norway. However, it was one of the worst places that we've been so far for mosquitoes, and apparently that's because they had a larger than normal snow fall last winter. Mosquitoes need still or stagnant water to breed and the melt water from the snow has provided places in abundance! So this morning we were on strict mozzie watch and every time we spotted one that had breached our defences one of us jumped up and leaped about until it'd been splattered😱! However, what really puzzled us was the fact that some of our neighbours were managing to walk about in shorts and T-shirts outside and didn't appear to be being eaten alive! Anyway, we quickly left the unpleasant wild life behind, and Mrs Snoopy kindly led us along the very scenic E10 towards the Abisko National Park which was about 30 miles away, and as we went we noticed how the character of the landscape was changing again. The dense forestation had given way to stumpy trees, rocky scrub land and cliff faces where there was often water cascading down on it's way to Lake Tornetrask. A magnificent back drop to all this was also provided by soaring snow capped hills that were reflected in the still waters of the lake. Abisko National Park lies in a mountain valley that was formed in the last ice age, and over many centuries the indigenous Sami people have used much of it's acreage for their reindeer. It was inaugurated as a Park in 1909, and it extends for 77 square kilometres that include areas of mountain, moorland, birch forest, meadow, wetland, streams and lakes and it also has lots of hiking paths for both short hikes and ones that would take several days. However, once winter sets in darkness descends for long periods and much of the terrain is frozen including the entirety of the massive Tornetrask lake. The lake is Scandinavia's largest mountain lake and extends for over 70 kilometres. Additionally, it has a depth of 168 metres and it's water's are said to be so pure that they are drinkable without any treatment - but I'm not sure I'd risk that, and did I say it was cold - even today with the sun beaming down it felt icy to the touch. We were heading for the park specifically to see the Abiskojokk Canyon where the river of the same name flows down from the mountains into the Tornetrask Lake. Our guide book informed us that the final 3 km of the river starts with a spectacular tunnel that once formed part of a hydroelectric scheme that was used during the railway construction. Apparently there is a waterfall at the end of the tunnel which marks the start of a canyon with sheer rock walls and rapids that have scoured the rocks to form narrowings and cauldron like features that the water very noisily rushes through. If we look happy it's cos we are! We'd much rather spend out time somewhere wild like this than in any city! We didn't go all the way to the top but the part we did see was quite breath-taking with not only the water providing it's magnificent display, but also the many colourful wild flowers that nature had splashed generously all around the area. We sat and had a drink by the rushing water perched on one of the rocky platforms right above the canyon's narrowest point - thus conversation was impossible but we didn't need to talk to know we were both enjoying it immensely. Following our visit to the canyon we returned to T4rdis2 for lunch and then nipped across the main road to the visitors centre that provided huge amounts of info about the park and it's surroundings. While we were there we learnt about the Moose, who can weigh in at about 250 lbs, and is the world's biggest deer. We learnt that the reindeer give birth in May and the babies stay with their mum for a whole year but are at risk from Golden Eagles, Bear and lynx. And we also learnt about the Golden Plover who I think we probably heard while we were out walking earlier - apparently it's a noisy little sod who makes a mournful fluting tune! There was loads more but I think you probably had to be THERE to enjoy it and my descriptions will probably only get boring if I go on, 😂 and on and on 😂- so I'll shut up for now! And really, there's not much more to tell about today except to say it's a shame we can't linger longer here, but our LPG gas is requiring another refill within the next couple of days so we really don't have any other choice than to move on into Norway tomorrow. (There's none available in this part of Sweden). You can just about see our camping spot on the right. For tonight we moved a bit further down the road to anther Rest Plat right on the the edge of Lake Tornetrask, and after I'd finished typing most of this blog (thankfully we've got a weak WiFi signal here) we took ourselves off for another short walk along the beautiful lake edge.